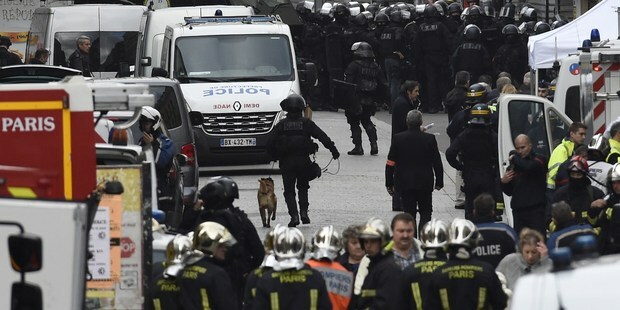 A HEARTBREAKING photo has emerged showing heroic police dog Diesel just moments before she was killed by a suicide bomber during the siege in Paris. The 7-year-old Belgian shepherd was killed last night in a firefight between police and Isis militants suspected to be behind the Paris attacks on Saturday. According to the Daily Mail Diesel was sent in to sniff out booby traps but was killed when the female suspect fired her AK-47 at police then detonated her suicide vest. Diesel had a distinguished career with the police and had been decorated with service medals. The French police tweeted an image of Diesel saying she "was killed by terrorists in the current operation in Saint-Denis". The world was quick to react to the latest tragedy to come out of Paris with tributes pouring in on social media. The hashtag #JeSuisChien (I am a dog) was quick to trend on Twitter. The raid was launched after information from tapped phone conversations, surveillance and witness accounts indicated the suspected planner of the terror attacks on Saturday, Abdelhamid Abaaoud, might be in a safe house in the district. The siege ended with two deaths and seven arrests but no clear information on the fugitive's fate.